The 14th International Conference of the Max Scheler Gesellschaft will take place in Guangzhou, China, at the Sun Yat-Sen University, from 24th to 29th November, 2017. Its core topic will be «Max Scheler and the Asian thought in the age of globalization». A call for papers is hereby announced, in order to select 10 Max Scheler scholars who will receive board and lodging during the Conference. Please submit to the President of the Max Scheler Gesellschaft, Prof. Guido Cusinato (guido.cusinato@univr.it), and to Prof. Liangkang Ni (hssnlk@mail.sysu.edu.cn), from the Sun Yat-Sen University: a curriculum vitae, a title of the paper and a short abstract in either English or German. Please check the validity of your passport already when submitting the application. Submissions must be sent within 1st May, 2017. The chosen candidates will be requested one photocopy of their passport, with at least 6 months validity from the day on which they will present the application for the visa. They will afterwards receive the official invitation to request the visa to the People’s Republic of China. Please remind that the visa has to be requested a couple of months before the departure. The Conference is aimed at analyzing and developing some of Scheler’s topics in an intercultural perspective, and at comparing them with the Asian thought. Core topics will be globalization, the Ausgleich between the East and West, grief, death, emptiness of the heart, health, medicine, and happiness. In this perspective, particular importance will be assumed by some Schelerian texts such as Vom Sinn des Leiden and Der Mensch im Weltalter des Ausgleichs. «Es gibt jeder Art von Schmerz und Leid gegenüber zwei ganz entgegengesetzte Wege, sie zu vermindern und aufzuheben. Der eine Weg ist der aktive äußere Kampf gegen die objektiven natürlichen oder gesellschaftlichen Ursachen des Schmerzes und Leidens — der resolute „Widerstand gegen das Übel“ als objektive Weltbeschaffenheit. Dieser Weg war im großen ganzen gesehen der Weg der abendländischen aktiv-heroischen Zivilisation. Der zweite Weg besteht in dem Versuche, nicht die Übel und hierdurch erst das Leiden an ihnen abzustellen, sondern das Leiden an allen möglichen Übeln von innen her zu unterbinden durch möglichst restlose und willentlich vollkommene Beseitigung des unwillkürlichen, automatischen Widerstandes, der, wie schon die Inder früh erkannt haben, ebensowohl eine Daseinsbedingung des Schmerzes und Leides ist wie der äußere Reiz, d. h. das natürliche und gesellschaftliche objektive Übel. Durch die positive geistige Kunst gerade des Nichtwiderstandes gegen das Übel — durch seine vollkommene „Duldung“ — soll hier das Leiden an ihm von innen, vom Zentrum des Lebens aus aufgehoben werden, indirekt aber das Übel selbst, da das Übel nach dieser Auffassung gar nichts objektiv Reales ist, sondern nur der dunkle Schatten, den eben unserLeiden an der Welt gleichsam auf die Welt wirft. Dieser Weg ist in radikalster, konsequentester, großartigster Form der Weg Buddhas» (VI, 55). However, «Das buddhistische Verhalten ist genau so wenig bloße Duldung, Hinnahme, Ertragen des Leidens wie der aktivste westliche Heroismus, der in Technik, systematischer Hygiene, Therapie, Zivilisation, Kulturarbeit seinen heißen leidenschaftlichen Willen auf die Aufhebung der äußeren Übel und Leidursachen geworfen hat, die er für real. Gerade dieser westliche aktive heiße Wille, das Leiden bis zu seinem kleinsten Atom und bis in seine tiefste Wurzel ganz und radikal aus der Welt zu schaffen — diese Zielidee des Willens und der fanatische Glaube an die Möglichkeit, dieses Ziel auch praktisch zu erreichen —, verbindet Buddha mit den Erscheinungen des aktivsten westlichen Heroismus» (VI, 57). The text that best expresses Scheler’s intercultural perspective is Der Mensch im Weltalter des Ausgleichs (1927). The concept of Ausgleich is fairly complex. In some respects, by the term “Ausgleich” Scheler means something similar to what we call today “globalization”. In this process, Scheler sees some dangers as well as opportunities. Indeed, he refers to two forms of Ausgleich: one that results into military conflict, destruction and leveling, and one that conversely leads to growth, flourishing and respect for differences. Understanding the logical processes that drive towards one direction or the other becomes therefore essential for the destinies of mankind. This volume is based mainly on the papers presented during the 13th conference of the Max Scheler Gesellschaft, which took place in Verona, Italy, from 27th to 30th May, 2015, with the title «Ordo Amoris and World-Openness. Philosophy of Emotions and Process of Individuation of the Person». There is not an immediate feeling at the roots of ethics, but an act of feeling that takes shape in a maturation process aimed at transcending the self-referential horizon of one’s own egological pole (epoché from egocentrism and narcissism). This act of feeling deals with the objectivity of value judgments just as the external perception deals with that of factual judgments, and is affected by phenomena of illusion just as the external perception. There isn’t therefore a priority of inner perception over external perception and even feelings and emotions are affected by phenomena of illusion and deception (M. Scheler, Die Idole der Selbsterkenntnis, 1911). This means that, at the core of the phenomenology of feelings, there is not an exaltation of an immediate act of feeling, but rather the process of cultivation of emotions through virtue (M. Scheler, Zur Rehabilitierung der Tugend, 1913). The aim of the conference was to deal with the above-mentioned issues, keeping in mind the current debates on personal identity, we-intentionality, the phenomenology of otherness and the role of embodiment. For some scholars there is also a need to emphasize the limits of classical cognitivism concerning emotions. David Hume had already proved that the problem of personal identity can no longer be understood in terms of a «rational self», but should instead start from passions, i.e. in terms of a «moral self». Is it possible to share an emotion, and in which way does Scheler enter into the contemporary debate about collective intentionality? How is the person shaped by others and by an ordo amoris? What is the relevance of the emotions for the formation process of the person? 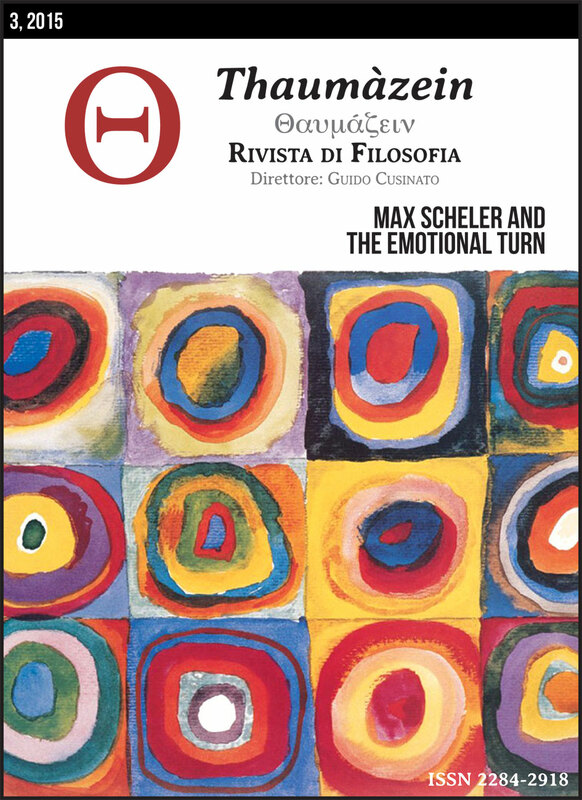 Although this issue cannot exhaust the variety of questions that involve the aforementioned topics, the scholars who contributed to this volume outline the richness and complexity of Scheler’s relevance for the philosophy of emotions. By collecting different viewpoints that concern the international philosophical debates, we are guided by the idea of furthering a perspective on the person that is more and more detached from any abstraction of a mind from the body, of feelings from reason, of the individual from the world. «Alles primäre Verhalten zur Welt überhaupt […] ist eben nicht ein „vorstelliges“, ein Verhalten des Wahrnehmens, sondern […] ein emotionales […] Verhalten» (M. Scheler, Formalismus, GW II, 206). The Max Scheler Society of North America (MSSNA) invites members of the international community of scholars to participate in their biannual meeting. The 2016 meeting will take place in conjunction with the North American Society for Early Phenomenology (NASEP), with sessions from each society running concurrently. Each society is having an independent call for papers. Papers and abstracts submitted for the MSSNA should be sent to the contact information below. All submissions for NASEP should be directed to the attention of Dr. Rodney Parker (rodney.k.b.parker@gmail.com). Broadly conceived, the general theme of the meeting is the phenomenology of value or axiology. The MSSNA is particularly interested in papers examining Max Scheler’s contribution to the study of value and the relevance of his work to recent investigations. Papers examining the significance of value in Scheler’s thought are not restricted to his ethics and may concern any aspect of his work. For this meeting, the intent is to have a program that reflects the tremendous diversity of Scheler’s thought and relevance of value in human existence. Participants will have approximately 35 minutes to present their work. Though completed papers are preferred, abstracts of at least 500 words in length will also be considered. Deadline for submission is December 15, 2015. All submissions should be sent electronically to Dr. Zachary Davis (davisz@stjohns.edu). Because all submissions will be reviewed blindly by the selection committee, submissions should have a separate cover sheet with name and contact information. Notification of acceptance will be sent out by January 31. Talks on the work of Frings and Scheler will be given by Karin Frings (Manfred’s wife), Zachary Davis (St. Johns University), Anthony Steinbock (SIUC), and Kenneth Stikkers (SIUC). For further information, please contact: Christina Bleyer at cgould@siu.edu. The perception of the importance of emotions changed radically during the decade from 1987 to 1996. This was particularly due to some works that reached the general public, such as R. De Sousa (1987), A. Damasio (1994), D. Goleman (1995) and J. LeDoux (1996). Before 1987 the dominant idea was that emotions were the tardy and secon­dary result of cognitive activity. 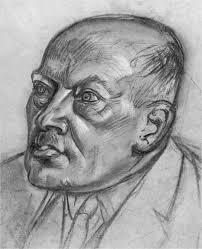 At the beginning of the twentieth century an important exception was represented by Max Scheler’s phenomenology of emotions, to whom the Conference is dedicated. We can attempt to sum up his position in six main points: 1. Feelings and emotions are not the final result of a cognitive process, on the contrary they are the origin of every perceptive and cognitive process: in the beginning was the emotion. In this sense, «every primary relationship with the world […] is essentially and primarily not a representational or perceptive relationship, but an emotional relationship» (M. Scheler, Formalismus, GW II, 206); 2. Feelings and emotions are not confined to a solipsistic dimension. They are what Feelings and emotions are not confined to a solipsistic dimension. They are what allows us to get into contact with others and make empathy possible. Through the act of feeling we are able to have a direct perception of the other person’s expressivity, without the need for an argument from analogy. In the other’s smile we can perceive his intentions and his happiness directly (M. Scheler, Zur Phänomenologie und Theorie der Sympathiegefühle von Liebe und Hass, 1913); 3. Feelings and emotions are not inner and private states, but they give shape to a precise “emotional bre­akthrough” (emotioneller Durchbruch) into reality: by which the human being places his own existence in the world. In fact emotions draw the landscape of our experience, they let shapes and irregularities emerge and outline elevations and abysses where only a flat and colourless plain would have existed (M. Scheler, Zur Rehabilitierung der Tugend, 1913); 4. In the human being feelings are not regulated au­tomatically. The development of an ordo amoris is a process that is not prearranged from the start, but on the contrary requires a formation process (Bildung). In this process of affective formation, every human being ushers in their singularity. Each ordo amoris matches a different perspective on World-Opennes (Weltoffenheit) (M. Scheler, Ordo amoris, 1916 ca. ); 5. There is not an immediate feeling at the roots of ethics, but an act of feeling that takes shape in a maturation process aimed at transcending the self-referential horizon of one’s own egological pole (epoché from egocentrism and narcissism). This act of feeling deals with the objectivity of value judgments just as the external perception deals with that of factual judgments, and is affected by phenomena of illusion just as the external perception. In contrast with Brentano, there isn’t therefore a priority of inner perception over external perception: even feeling and emotions are affected by phenomena of illusion and deception. This means that, at the core of the phenomenology of feelings, there is the problem of emotional maturity (M. Scheler, Die Idole der Selbsterkenntnis, 1911); 6. To rehabilitate emotions doesn’t imply an individualistic ‘emotionalism’: the rehabilitation of emotions is not aimed at the exaltation of an immediate act of feeling, but at the process of cultivation of emotions that leads to self-transcending of the immediate act of feeling through virtue (M. Scheler, Zur Rehabilitierung der Tugend, 1913). The aim of this conference is to deal with the above-mentioned issues, keeping in mind the present debates, in particular the ones about personal identity, about the phenomenology of otherness, about the concepts of body schema and body image and about the we-intentionality. For some scholars, there is also a need to emphasize the limits of classical cognitivism concerning emotions. David Hume had already proved that the problem of personal identity can no longer be understood in terms of a “rational self”, but should only start from passions, i.e. in terms of a “moral self”. Hence, a sequence of open questions: in what way does emotional experience affect the individuation process of a person? In what way are individual transformation and social transformation intermingled? In what way do feelings guide our relation with the world and with otherness? In what way do emotions allow us to express and shape what we are? 5) Im Menschen sind die Gefühle nicht automatisch geregelt: Die Bildung eines Ordo amoris ist ein Prozess, der nicht von Anfang an vorherbestimmt ist, sondern einen Prozess der Bildung erfordert. In diesem Prozess der affektiven Bildung inauguriert jeder Mensch seine Singularität. Jedem Ordo amoris entspricht eine verschiedene Perspektive für die Weltoffenheit (vgl. M. Scheler, Ordo amoris, 1916 ca.). Der Zweck dieser Tagung besteht darin, uns mit diesen Themen auseinanderzusetzen, mit besonderer Rücksichtnahme auf die aktuellen Diskussionen über die personale Identität, über die Phänomenologie der Andersheit, über das body scheme und das body image und über die we-intentionality. Für einige besteht die Not, auch die Grenzen des klassischen Kognitivismus bezüglich der Problematik der Gefühle deutlicher zu unterstreichen. Bereits David Hume hat gezeigt, dass das Problem der personalen Identität nicht mehr allein im Anschluss an das „rational self“, sondern nur ausgehend von den Leidenschaften, d.h. im Anschluss an das „moral self“ verstanden werden kann. Von hier her rühren eine Reihe von offenen Fragen: Auf welche Weise wirkt sich die emotive Erfahrung auf den Individuationsprozess der Person aus? Wie hängen die individuale und die soziale Umbildung miteinander zusammen? Auf welche Weise leiten uns die Gefühle in unserer Bezugnahme auf die Welt und auf die Andersheit? Wie erlauben uns die Emotionen, uns auszudrücken und das zu bilden, was wir sind?